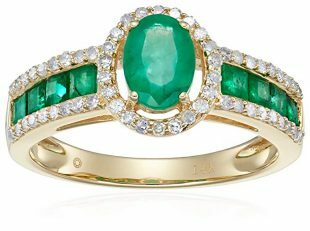 10 Emerald Rings and Why to Get One for Your Jewelry Collection! We are sure you are presently thinking about the numerous benefits that come with using the emeralds ring. 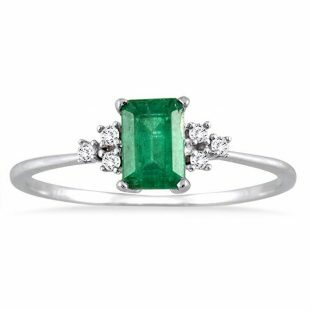 Before we dig deep into this, let’s ask you a simple question; Are emeralds an excellent choice for engagement rings? Yes, they are. While emeralds are not as strong as let’s say, diamonds or even the cheaper ones in the form of Cubic Zirconia, they’re still one of the most beautiful types of gemstones available to man. Accordingly, everybody should get one. Emerald depicts hope and helps to relive special moments, which is an ideal representation for an engagement ring. In addition, they represent peace, fertility, healing, strong bond, growth and balance. If after these definitions, you’ve finally made a decision to opt for an emerald ring, there are several options to choose from. And we’ve reviewed the best of them below. Do you want to express your love to your significant other or to that special person in your life? There is no better way to show exactly than presenting a stunning jewelry featuring his/her birthstone. That said, what are the features of this ring? It is made with genuine 925 sterling silver ring which is then triple-plated with rhodium. This gives the ring the white hue you see as well a long lifespan. Following that, there are Grade A Cubic Zirconia stones just below the emerald itself. As for the gemstone itself, its measurement is 8mm*10mm, which is rather generous considering the budget-friendly price. That said, the CZ stones are strong and they do not fall out that easily which is one part a lot of other manufacturers still can’t get right. With all of the this, you have a ring that’s literally timeless. This implies that you can use the ring for an indefinite amount of time. Provided of course it’s regularly polished, cleaned, and kept safe (avoid falls or worse, stepping on the ring). As to the applications, we think this should be kept for special occasions like birthdays, weddings, or even on your anniversary date. If you don’t want to gift it out, you should instead use it. We recommended the ring as a gift because of its good looks and toughness, and if we can fully back that idea up, you can go right ahead and wear it too. This stunning ring reveals the emerald’s delightful green depths in an evergreen setting. The central emerald is oval in shape and it has a weight equal to half of a carat which is offset by a magnificent halo of diamonds. Further, all of these stones are encrusted in 18K white gold thereby giving it a beautiful appearance. As a result of this, this is a ring that you can wear to literally any occasion, albeit we think you should limit it to the ones that actually require you to make a statement. Otherwise, you can present this ring as a gift to your loved ones or your lover. We doubt that you actually need any reason to give her the ring out of the blue. Albeit with the high price, most people will only want to give the ring on a maybe a birthday or anniversary. It’s certainly a nice idea as well and we encourage you to go through with it if you have the same intentions on your mind. The trick here is to give a gift that she’ll never forget, so you’re good regardless if you’re following our tip if you’re going with yours. First, let us talk about the features of this ring. It includes a gift box, exclusive styling, and a craftsmanship that’ll easily catch the attention. 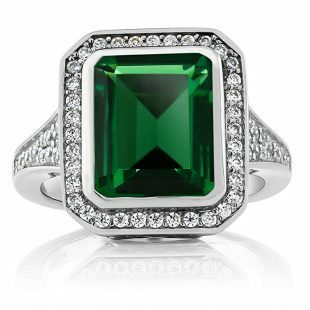 At the center of the ring, you’ll find the emerald stone giving off a rich forest green hue. So if you’re one who loves the color green and also doesn’t mind the attention that a statement ring like this brings, we think you’ve found the perfect fit. 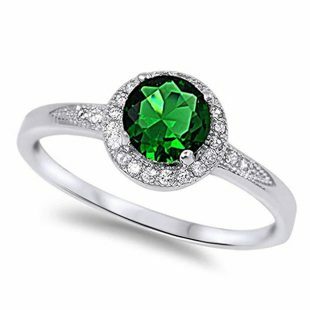 More so with the inclusion of 44 pieces of white Cubic Zirconia that surround the emerald and also accentuates the sides of the ring. As usual, the maker opted for Sterling silver as the go-to metal for making the ring. A layer of rhodium is applied to the surface, and other than the fact that it boosts the already fine looks, the ring also gets a hike in lifespan. Examples of occasions where the ring will be perfect as a gift are Christmas, Graduations, Valentines’ Day, Birthdays, Mothers’ Day, and so on. As for the message, you can either adopt the definition of emerald itself or you can send the gift card with a message of good intentions. Whichever one you choose to use, it’s a win-win situation. We recognize Merthus because of their collection of unique jewelry. We mean, they always use the most different design around and this emerald ring is just another example of their craftsmanship. This ring is created from 925 sterling silver which is highly polished, well-crafted, and then coated with rhodium to ensure that it keeps its flawless form for as long as possible. At the same time, the use of silver as the only metal in the ring means safety is never an issue. Silver, unlike other jewelry accessory, doesn’t cause discoloration nor does it cause allergic reactions. Likewise, silver with the presence of rhodium coating on top of it is one of the most durable choices that you can pick. This makes it usable not only by you but also by anyone that you know since the durability ensures it’s a gift that’ll remind them of you. To that, who do you have in mind when it comes to surprise calls? We would like to mention your Mom but at the same time, we can’t ignore the fact that your partner would love something like this as well. So either give any one of them the ring on an occasion or make it a surprise. For the last part, just put yourself in her position. You’re working on something one day and she suddenly buys some shoes. It’s exactly how you’ll feel in such scenario she’ll also feel. When we’re talking about the kinds of features we would like to see in an emerald ring, we only have 2. The first one is durability, while the second is the aesthetic appeal. Other than those 2, features like safety due to the absence of nickel, a variety of sizes ranging from 2-11mm being available, and being hypoallergenic are the complements. If you want to stand out on any occasion, all you need is a ring like this. It’s not too flashy since the CZ stones surrounding the circular emerald is kept minimal. Thus, it’s perfect for occasions where you don’t want that much attention—which leads us to the next topic. Who can you give the ring to? We think this is the ultimate gift for couples, albeit the man will do the gifting. It’s certainly a nice way to add a bit of variety to your relationship suddenly and thus, eventually reigniting the already burning love and loyalty. Further, the ring is made from Sterling Silver, known for being one of the more beautiful and durable metals you can invest in. So we chose it adds the necessary amount of toughness to ensure that the ring, or better yet, the gift isn’t going to quit on her anytime soon. The uniqueness of this particular piece lies in the fact that instead of the conventional one ring that we’ve been seeing so far, this one employs a design that seemingly looks like there are 2 rings. Notice the word “Seemingly” since it’s actually still a single ring. A big emerald is set into the center of the ring on one side while on the next side, you’ll find a ruby instead. This is definitely special when compared to others here, but the amount of ingenuity and the fact that they provide options with a single ring is simply awesome. We think your partner would love a gift with such detail. The metal that carries all of these gemstones is 925 Sterling silver and gemstone. To be more specific, the silvery white parts are obviously Sterling Silver while the yellow parts are made with bronze. Both combine to make a unique mix of metal that doesn’t fade nor easily dent. The former is because there’s no plating at play here while the latter is an indication of both metal’s durability. The first thing that caught our eyes was the gift packaging. You can select between a luxurious leather or a dainty foam box for the ring. Now, the actual reason why we like the variety of boxing options is because of the application. If you’re going to be using this as a proposal ring to your significant other, the luxurious leather pick is simply perfect since it carries more meaning and it’s considered being thorough by us women. Otherwise, the dainty foam box is what we would consider if you’re thinking of giving impromptu gifts. The ring features white CZ stones and a vibrant emerald cut into the heart. And while we could say you can wear it to any occasion you can think of, it depends on your preference or the preference of the person you’re giving it to. If you think she can’t wear a ring with a stone this big and flashy, then opt for another emerald ring on the list. You have options! So make sure you explore them all. The ring, like the rest on the list, uses sterling silver as the only metal. This composition gives the ring considerable leverage against tear and wear which cannot be avoided. This thereby makes the ring perfect for daily use. Just make sure you do the occasional maintenance to keep the whole accessory in excellent condition. 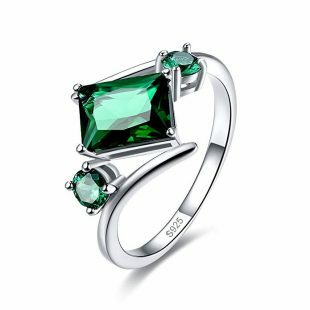 Wholly crafted from Sterling silver, the ring features a stunning cluster of CZ simulated diamonds and then a rectangular emerald right in the middle. The overall look is stunning which is the main reason why we say this. We think this is perfect for an engagement ring. The design adopted by the manufacturer is different (in a good way), which makes it fitting for the occasion. Asides this, there are several elements incorporated into this item that we like. An example is the use of platinum for the plating of the silver. Ordinarily, silver is beautiful due to its substantial amount of luster, but then you have platinum which although has the same color, is by far more beautiful. This, in turn, cements our notion of the ring being one of a kind. Though, if you’re planning something other than an engagement, try to restrict giving the ring during special occasions like anniversaries and the likes. It comes packaged in a jewelry box, polished and nicely cut, with a really nice appearance. Your partner or maybe your bestie will love the attention to detail and its application to certain circles. The fact that despite all of these features and the ring’s applications, the ring is still affordable is the cherry on top. 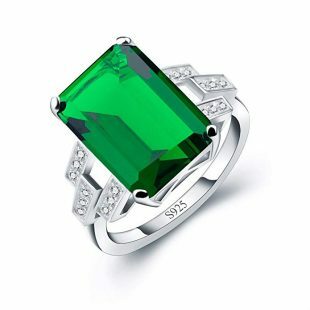 This ring from Szul features a genuine emerald gemstone which comes with 6 diamonds on a band of 10K white gold. It’s definitely pricey, but the clean look you get is more than worth. What we mean is this; most of the rings on this list are big and so might be considered unwieldy by some. So here’s where this particular one comes in. It’s minimalistic in design—which is to say that it’s small. Thus, out of all the ring so far, this is by far the most versatile to use. Simple to wear, vintage-styled simple, and extremely well made to ensure it can easily turn into an heirloom. Especially if you’re planning on using this as an engagement ring. On the chance that you’re not doing that, it’s suitable as a gift for your daughter for graduating. Otherwise, it’s a worthy investment to make for yourself. Crafted from Sterling silver which is then plated with rhodium, this ring is certainly no slouch despite its position on the list. And to show what we mean, let’s talk about the benefits of using Sterling silver (SS for now), then the rhodium plating. SS is known for its considerable amount of durability, applicable looks, and safety which is a rare combination. 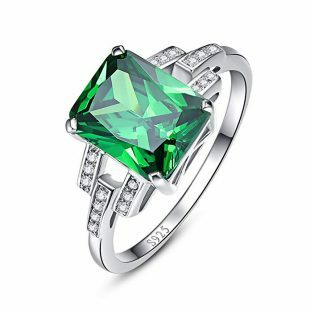 The first one ensures that this emerald ring won’t disappoint you, which is a requirement when it concerns giving it out as a gift. Being beautiful is one thing—another is having a physical appeal that can be applied to most settings. This is seen with this particular ring since the size itself adds to the flexibility or might we say appeal. Following up on that, safety is for the avoidance of allergic reactions or irritation. Certainly important if the person you’re gifting the ring to is particularly sensitive. Try asking them if you’re unsure. Now with all of these benefits, rhodium plating comes to play also. And while we love the somewhat greenish tint that it gives the ring since it’s quite different, the protection it offers is more important to us. It seals in the perfect hue of silver so it can properly stand the test of time. All this despite the reasonable price. While rubies stand as the slick ambassadors (literally or otherwise) of passionate love, emerald stands for a collection of things. They depict a complex set of emotions and in the end, are symbolic as well. Green is the most relaxing of all the colors when considering the color wheel. It encourages peace, balance, growth, and personal reflection. Similarly, it is the ideal representation of fertility and healing. Which one has more worth, diamond or emerald? This comparison is definitely relative since it depends on the clarity of both the diamond and emerald. A dirty diamond, with the yellowish tint and all, doesn’t have anything in a emerald with a hue that’s green-borderline-black. On the other hand, the more a diamond is transparent (though the cut and size should be taken into consideration too), the higher the price. In order to effectively measure the ring size of your partner, we recommend the following processes highlighted below. First, get a string and use it to cover the base of your ring finger completely. Afterward, use a pen/marker to put a mark on the point of the string where the end connects. You can now use a ruler to get the measurement of the string. Finally, select the closest measurement to the provided chart for any ring that you select. Ensure that your knuckle has enough space to accommodate the ring fingers are not equal. Avoid measuring your finger in the morning due to salt retention from the previous night’s dinner. Likewise, know that cold weather causes your fingers to shrink, so either skip any measurement that’s planned for any cold or adjust the measurement a bit. In relation to that last note, you should do multiple measurements to ensure you get the best accuracy. Spread it out over a day or 2 to make sure you get the perfect measurement. You’re obviously going to be wearing it for a while, so it’s imperative you get it right. How to detect a genuine emerald? It’ll definitely hurt if you buy an emerald ring thinking it’s completely genuine. So in order to avoid that, we suggest that you evaluate the emerald jewelry you want to purchase thoroughly. Having said that, you can follow the guidelines highlighted below to do just that. Despite the tips we offer above, you should still be careful, seeing as no method is fool-proof. Why choose the emerald ring? 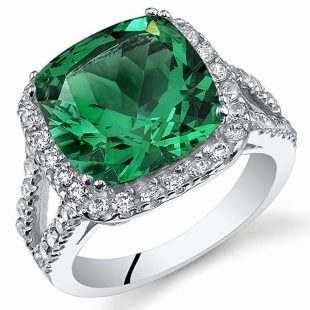 One fact about emerald is that it’s one of the most popular and thus, sought-after rings available on the market. The principle is simple—the more the demand of a particular item, the more stable its price is. Still, this is only good if you’re not intending to use the ring as a gift. But on the chance that you are, green is a symbol that we like to relate to eternity, other than the primary definitions we gave above (peace, balance, etc). If the item is going as an engagement ring, you’re telling her you’ve got her back for eternity. It’s definitely corny, but the message works rather well so we have no complaints. Other than that definition, emerald has also been associated with good fortune, eternal youth, and love. To our knowledge, there’s no one woman out there that wouldn’t like to be associated with such tags. What is the best emerald color? Emerald has been known to be in green colored form for thousands of years. However, it requires a good eye to recognize the several variations that it comes in. 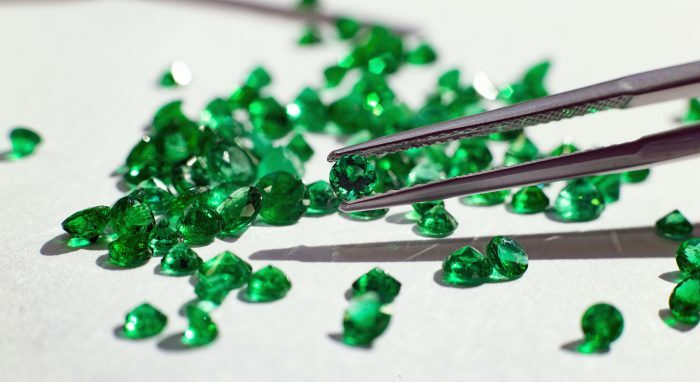 The most popular color of emerald includes pure green and bluish-green and 2 characteristics that you must see is great color saturation and a tone that is bright. The most valuable emeralds have a high transparency. Their color is distributed equally in the product and has no visible impurity. Keep in mind that if the hue is too bluish or yellowish, that implies that the stone is not apparently an emerald. How to measure the emerald’s clarity? First, what does emerald clarity implies? This refers to the visibility, number, and size of the flaws dominant in an emerald. The internal flaws that exist naturally during the formation of gemstones are referred to as inclusions. Always keep in mind that there are always inclusions in emeralds. No effort on any company’s part can get rid of such tiny irregularities. Still, if you notice that the emerald ring you’ve purchased does not have any inclusion, then there is a high probability that it is fake. That point made, any emeralds with inclusions that have a close proximity to the surface should be avoided. That can lead to cracks or lines that’ll spoil the whole look. Finally, before we conclude this part, keep in mind that in general, emeralds have higher values depending on fewer inclusions and better clarity. 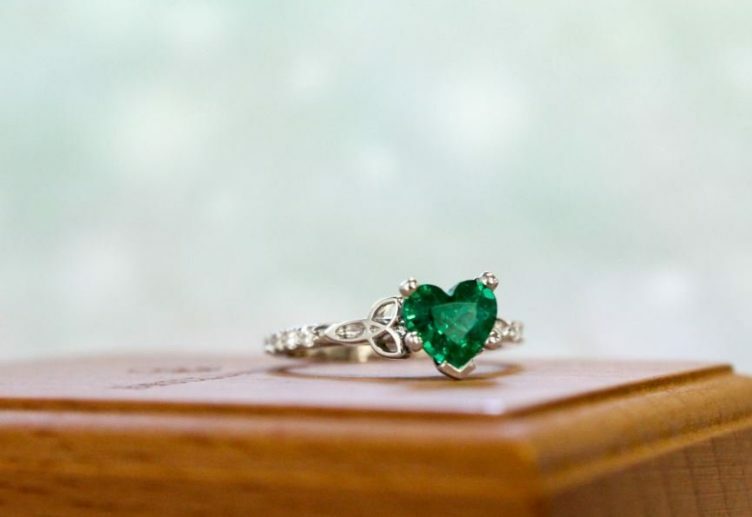 What are the tips for maintaining an emerald ring? 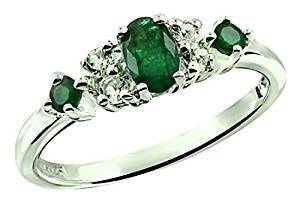 Since you’re dealing with emeralds here, it’s imperative you take good care of it since it doesn’t have the same hardness as let’s say, diamonds. So the first thing to note is that you should never use the jewelry when you are washing your hands or even handling the dishes. Heck, we can even say you should avoid getting any emerald ring in direct contact with water. While it’s not going to tarnish easily, the cumulative effect is going to show in due time. Let’s try to steer clear from that. The second tip is to always clean the ring with a soft, dry, clean cloth if you’re dealing with dust. To remove oil, perspiration or any other residue, use a damp cloth to pull this off. Tip 3 is to avoid ultrasonic cleaners, heat, hot water as well as hairsprays and cosmetics. 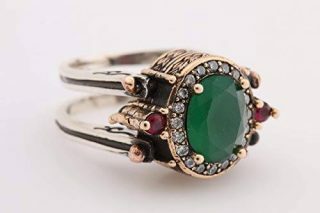 An emerald ring supposedly improves the well-being of the wearer and also brings good luck. We don’t know how true this is (actually pretty far-fetched), but we do love the implications. 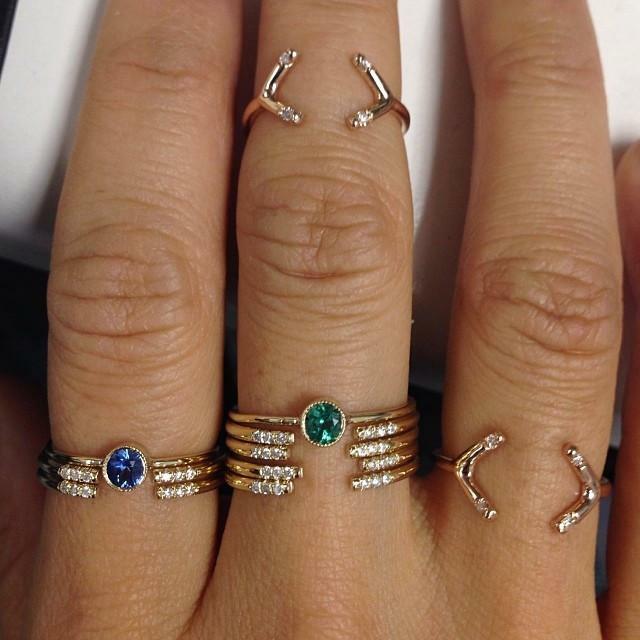 Emerald rings are one of the most beautiful pieces that you can invest in right now. The fact that they’re quite different from the norm (diamond rings) helps with the image a lot too.